Defend Mark Harding, drop the charges now, defend the right to picket. 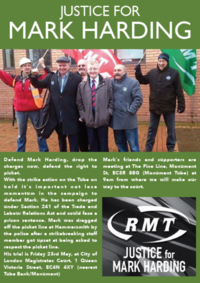 With the strike action on the Tube on hold, it is important not to lose momentum in the campaign to defend Mark. He has been charged under Section 241 of the Trade and Labour Relations Act and could face a prison sentence. Mark was dragged off the picket line at Hammersmith by the police after a strikebreaking staff member got upset at being asked to respect the picket line. Mark’s friends and supporters are meeting at The Fine Line, Monument St, EC3R 8BG (Monument Tube) at 9am from where we will make our way to the court.